So. Earlier this week I took my sofa apart to begin hoovering underneath the cushions, down the sides.. You know the drill. I should note that this isn't a yearly ritual, or something that I haven't done before (I'm diagnosed obsessive compulsive tendencies) It happens on a bi-weekly basis. But this time. Not just the odd coin. Maybe a piece of cereal. Oh no. I had to take a photo. How on earth all of this managed to amass in such a short space of time is beyond me. So I've taken some photos, and compiled a list for you. 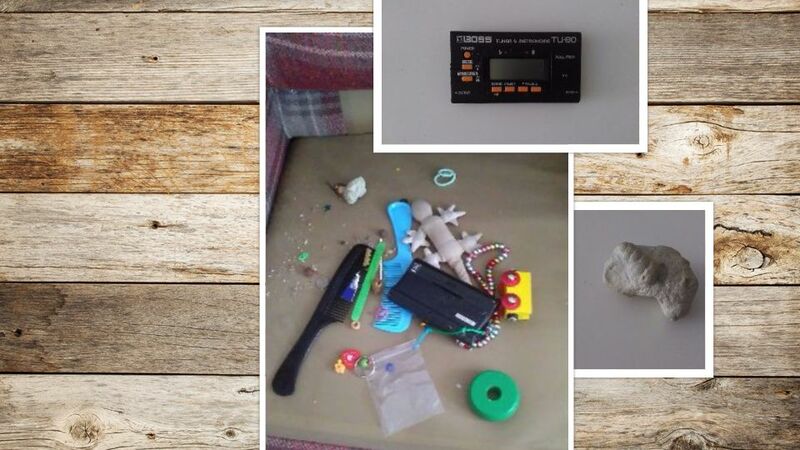 It got me wondering what the strangest items people have found under their sofas might be. One Lone Bobby Pin (Or Kirby grip, call it as you will). A Green Wooden Lollystick from a craft set. One Blue bead in a tiny plastic bag. I'm not sure if that can be beaten. If it can. I want to know. No. I need to know. If only to make myself feel better.